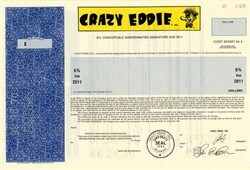 Beautifully engraved RARE SPECIMEN stock certificate from Crazy Eddie, Inc. This historic document was printed by the United States Banknote Corporation and has an ornate side border with a vignette of the company logo. This item has the printed signatures of the Company's President ( Eddie Antar ). This is only the second time we have seen a bond from this company. Crazy Eddie was an electronics chain which was primarily located in the Northeastern United States. It was started in 1970's in Brooklyn, New York by businessman Eddie Antar. In television and radio commercials, actor Jerry Carroll portrayed the hyperactive Crazy Eddie proclaiming "Crazy Eddie will beat any price you find" and "Crazy Eddie His Prices Are Insaaane!". In 1989 the Crazy Eddie chain suffered a major scandal when Eddie Antar and his family were accused and eventually convicted of skimming money and cooking the books and inflating inventory. Antar fled to Israel where he lived until 1994 when he was extradited back to the United States.